Due to the vertical, self supporting stilts, positioning a Stiltz Home Lift into your home is very flexible. It is free standing so no load-bearing walls are required, and you don’t need to worry about window or radiators being in the way. It can tuck into the corner of a room, the stairwell void, on a landing or even in a cupboard! No visible hoists and no noisy motors. Stiltz Home Lifts’ unique technology means the lift runs using discreet wire rope hoists and built-in drive equipment which are all neatly concealed within the lift car roof space. Meaning more space in your home for you, your furniture and your décor. Stiltz Home Lifts plug directly into your domestic power sockets. In the event of a power cut, a battery back up will gently return you to the ground until power is restored. To get you from floor to floor, the lift is operated using the intuitive in-car control panel or through remote controls from outside the lift. One of the smallest footprint of any wheelchair lift – covers just 0.8m² surface area. Powered by a quiet electric self-contained motor – no noisy hydraulics. Lifts are made up of modular sections – standard installs take just one day. Plugs into normal 13 amp power socket – like any other household appliance. Self-supporting structure – two parallel and vertical guides bear the load of the lift. Housed at the top of the lift, out of sight – no need for external power packs. Single floor. With a maximum of 4000mm of travel. 230V socket – Plugs into a normal 13 amp power socket. Max. 170kg / 2 people. Self-contained wire rope hoist system located in lift car roof space. Lift is controlled via the control panel and two remote controls. Additional remote controls are available. 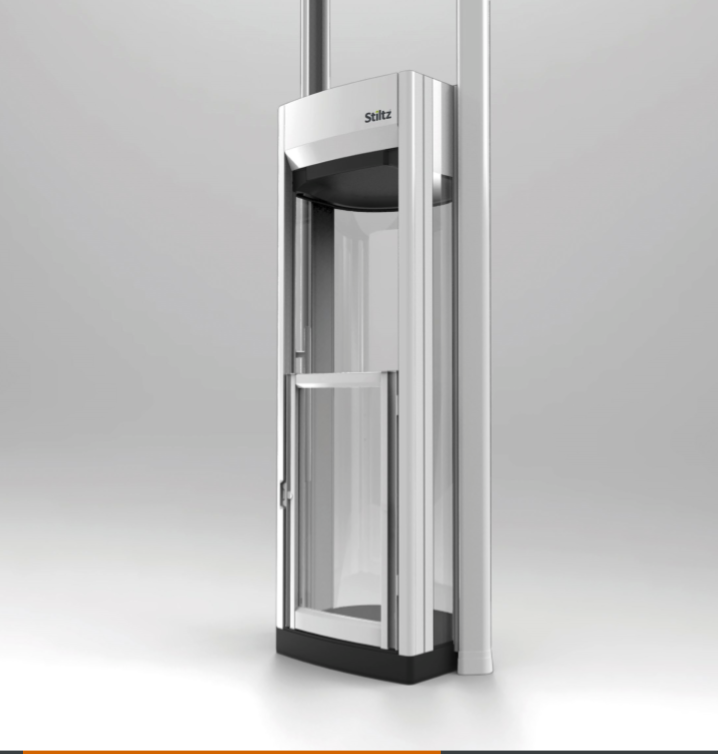 1100mm hinged half-height door or full-height door options available. Full height LED light curtain will protect entire door height. Contemporary ambient lighting with high-quality LED strips. The half-height door is equipped with a subtle LED light curtain which detects obstacles and gently brings the lift to a stop if the light is crossed. This feature is available as an optional extra with the full height door. The lift will only move from stationary when the lift car door is fully closed. Sensors positioned to the top and bottom of the lift will automatically stop the lift car immediately an obstruction is detected. The lift car door is secured by a strong locking mechanism which is also very easy to open and close.